Lose up to 10 lbs. in 14 days* - for FREE - with GENESIS. 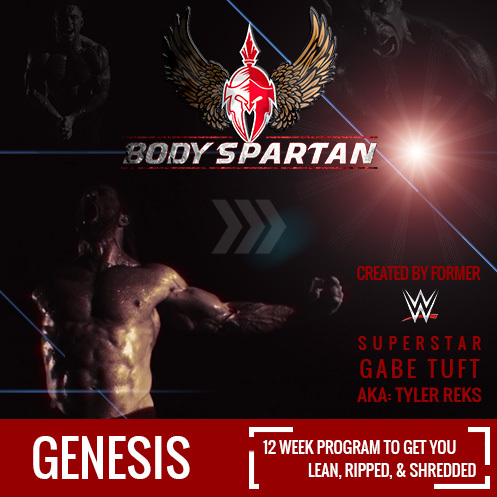 It's our breakthrough 12-week program from Body Spartan Founder and WWE Superstar, Gabe Tuft. Genesis was the very first workout program with custom ketogenic diet macros to hit the internet. This in-gym workout program will shred body fat in as little as 14-days - all while gaining muscle mass. Anyone who's tried one of his workouts or programs knows that Gabe Tuft breaks the mold and doesn't sugar coat anything. A former WWE Pro-Wrestling Superstar, Gabe has shown millions how to achieve goals they never thought possible and helped them get into the best shape of their entire life. With the Genesis Program, he will not only ensure you get results, but educate you on how to keep them. It literally costs nothing today and only takes minutes to get started. There are instructional videos that fully explain every aspect of the Genesis Program including workouts, each exercise, nutrition, motivation, and goal setting. We custom calculate your macros and tell you what to eat to get incredible results with your program. "With the combination of clean diet and proper workout routines, I was able to transform my body completely! And get this, I even still have 3 weeks left of the program!" We prove it with thousands of satisfied customers and world-class, scientifically based programs like GENESIS, G2, REVOLUTION, IGNITE, SAVAGE SHRED, and more. Losing body fat and gaining muscle mass has never been simplified like this. How will you look & feel 14 days from now? Will you have remained the same as you are right now? Or will you be on your way to being in the best shape of your entire life? With over 50,000 satisfied customers, we've proven GENESIS works. Right now, we want to prove it to you. You've got absolutely nothing to lose and everything to gain in the next 14 days. Every epic story has a beginning. Will today be yours?